How Do I Connect My Commodore 64 / Commodore 128? 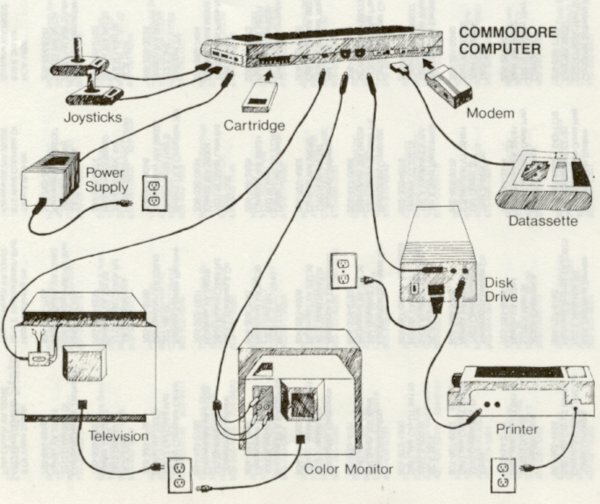 The following information and graphic are taken from the last page of the “Authorized Warranty Repair Locations” manual for a Commodore 64 or Commodore 128 computer dated October 1985. Do they match the connections shown in the diagram below? Are all power switches turned ON?It you’re using a TV set for your display, is the switch on the computer’ TV switch-box set to computer? Is the TV tuned to either Channel 3 or Channel 4? If you’re using a video monitor for your display, are all monitor switches set property? For complete instructions on setting up and turning on your computer and peripheral equipment, see your User’s Manual. TAKE YOUR UNIT TO THE SERVICE COMPANY OF YOUR CHOICE.